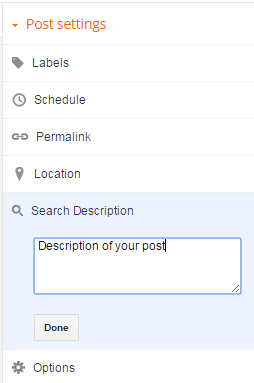 An Important part of optimizing SEO is adding Meta-tags description. Every blogger wants to see their blog first on google. Just writing a quality post is not enough for successful blogging. You also have to provide about your post’s information to get higher rank in google. The Meta description is an HTML element which tells search engine’s crawler about the web page. This description will appear as the fragment in search results and as a description when sharing on social media sites. A clear description increases the chance of getting more clicks from search engines. So you can easily understand why it is very important for your blog. It is a Vital tool for SEO(Search engine optimization). Recommended: – How to Add Responsive Sitemap to Blogspot blogs? Then click on save changes. Now it’s time to adding meta description to individual posts. simply edit the post and look for search description on the right side and there enter the text and save by clicking done button. Hope this post helped in your quest of doing SEO for your Blogspot blogs. Have any question and doubts, please do comment and don’t forget to share this information. How to Create a Blog on Blogspot Platform? I am a Software Engineer but my profession is blogging and web development. I had started my blogging career in 2017. I will share with you interesting ideas for making money, providing free themes, plugins, tutorials and technology news . Read More..